Work has begun to extend the boardwalk on Shoreham Beach to help make the conservation area more accessible. Construction started on Monday to lay the new section of the boardwalk from The Burrells roundabout to Shoreham Fort. Liza McKinney, a former councillor who lives in Old Fort Road, raised concerns that the new section of the path curved closer to the houses on the beach than originally planned. 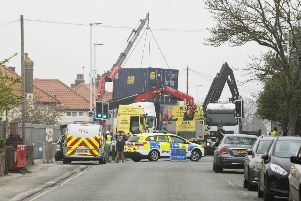 However the council said no changes had been made to the planned route. Councillor David Simmons said: “Contractors, who began laying the extension this week, have been using a haulage route to access the site which is slightly closer to existing homes than the agreed site where the boardwalk is being constructed. He said residents had been fully informed about the route of the extension. “Shoreham Beach is a unique and sensitive conservation area, which is why great care has been taken at every stage to protect the environment, inform the public and get approval from the Friends of Shoreham Beach, local councillors and other partners before work to extend the boardwalk commenced,” he said. “Two letters and an additional notice informing local residents of the route were hand delivered to all neighbouring homes, and details were also published in local media.